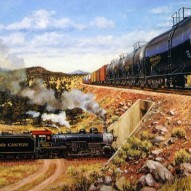 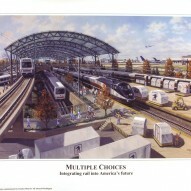 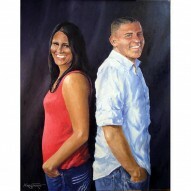 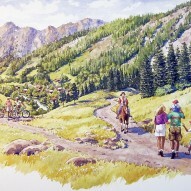 InterModal rail hub – Oil-on-canvas 24″x36″ commissioned by Charles Mott and used by Gil Carmichael of Intermodal Transportation Institute, University of Denver, CO to promote interconnected passenger and freight rail systems. 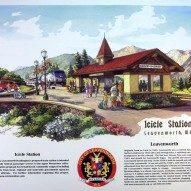 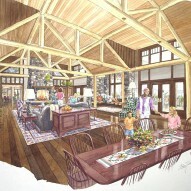 Icicle Station – Ink and watercolor 18″x24″ commissioned by the City of Leavenworth, WA to showcase the new Amtrak train station; used on posters, postcards, and pins. 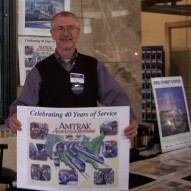 Amtrak poster – Oil-on-canvas 24″x24″ commissioned by Amtrak for National Train Day 2009; showing possible electrified rail services between Chicago and St. Louis. 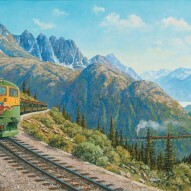 Inspiration Point – Oil-on-canvas 16″x27″ commissioned by the White Pass & Yukon Route, Skagway AK; one of an open series of paintings used on calendars, cards and other products showing a WP&YR train at Inspiration Point, AK.